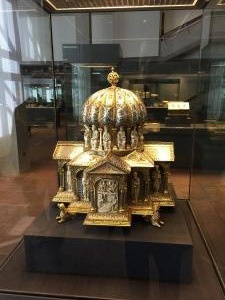 As readers know, my clients Alan Philipp and Gerald Stiebel sued the Federal Republic of Germany and the Stiftung Preussischer Kulturbesitz (SPK) in February for restitution of the Guelph Treasure (or Welfenschatz as it is known in Germany), assisted by my co-counsel Mel Urbach, Esq. and Markus Stötzel of Marburg, Germany. As my co-counsel speak to an event tonight hosted by Congresswoman Grace Meng on the anniversary of Kristallnacht, an event inextricable to the persecution of Jews in Europe, Germany’s response to the Complaint advances a stunning revisionism about the Holocaust and the international commitments that Germany has made. While paying lip service to the seriousness of Jewish suffering, the papers filed in court are nothing less than an attempt to move the goalposts to exempt a historical period from responsibility about which there can be no serious debate. Independent condemnation was not far behind the filing. Gurlitt and the State of Restitution: Triumphalist Moment Looking More Like Premature "Mission Accomplished"
Ongoing events have weakened irrevocably the triumphalist message that Germany had hoped to send with its November agreement concerning the Gurlitt bequest to the Kunstmuseum Bern, and the January opening of the Deutsches Zentrum für Kulturgutverluste (the German Center for Lost Cultural Property). Instead, the self-congratulatory air that surrounded those events is starting to look like a premature "Mission Accomplished" moment.